The midfoot gets no respect. While people can relate to a stubbed toe or sprained ankle; the part of the foot that connects the two, and is responsible for helping absorb the shock of walking, running, and jumping isn't given much thought. Not so for the French surgeon Jacques Lisfranc de St. Martin, a surgeon in Napolean's army. Dr. Lisfranc studied the midfoot bones, the joints where they connected, and the ligaments that held them together. Understanding that anatomy led to his name being attached to the classic Lisfranc fracture dislocations that occurred when horsemen fell and their foot was trapped in the stirrup. Most people, including doctors (except for orthopedic and podiatric surgeons) quickly forget or vaguely remember about the row of bones between the ankle and the metatarsal bones (the long thin bones that lead from the toes to the middle of the foot). But the relationship of the cuneiforms and the cuboid bones allow the foot to disperse the energy and shock that is generated by the weight of the body. A Lisfranc injury disrupts those joints that hold the midfoot stable. While history said that the injury was equestrian in origin, the most common cause of a Lisfranc fracture is stepping into a hole and falling forward. The toes of the foot are trapped and pointed downward, and in car accidents the foot is trapped and rotates. This is also the same mechanism that can occur in football, where a pointed toe gets caught and an opponent falls onto the back of the heel, most often damaging the Lisfranc joint. History names parts of the body based upon discovery, and the Lisfranc ligament describes the connection of the second metatarsal (that attached to the 2nd toe) to the medial cuneiform (one of the midfoot bones that can be palpated or felt on the top of the foot). When injured, this area can swell and be very painful. Walking is difficult, and patients often mistake this for an ankle sprain. If there is just a sprain, the physical examination can reveal only minimal swelling and the findings can be subtle. However, if there are broken bones and the joints dislocated, the appearance of the foot can be quite dramatic with significant swelling and pain. X-rays can be deceiving. Sometimes the injury is obvious, but the X-rays can appear normal. It is up to the doctor to have a high index of suspicion to look for the ligament damage, and subtle alignment changes of the joint. If that suspicion is high, the doctor may order a CT scan to look for an occult or hidden fracture. The doctor's intuition is important in this injury because up to 50% can be missed on plain X-ray films. If a Lisfranc injury is present, the treatment depends upon the bony alignment. If the bones are where they are supposed to be, treatment in a non-walking cast for 6 weeks may be enough. It's important to remember that close follow-up is needed in case the bones shift in position. If the initial alignment is poor, surgery may be needed to place a screw across the injury to keep the bones in place. Unfortunately, after the injury heals, good looking X-rays may not provide good looking results. Up to 25% of patients with a Lisfranc fracture that is well treated may go on to develop arthritis in the joint and intractable pain requiring fusion of the joints. Lisfranc learned in the 19th century what we know now to be true. Sprains are significant injuries where ligaments tear and joint surfaces shift, and this type of injury should not be ignored. The lesson also learned is that history and physical examination are perhaps more important than tests and X-rays. Touching the patient and understanding the mechanism of injury are cornerstones of diagnosis. 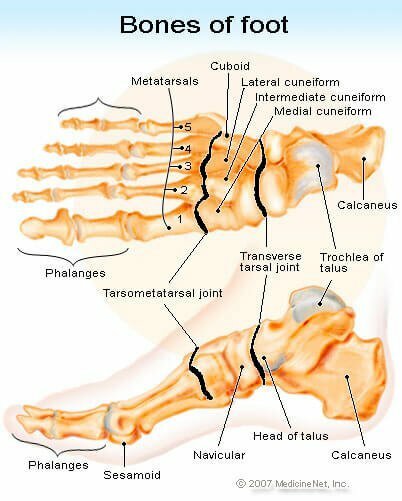 "Tarsometatarsal (Lisfranc) joint complex injuries"